On last week’s episode, Team Banony was eliminated by Sylvia and Joss and ShaNelly was eliminated by, well, ShaNelly. After taking the lead on the Lavender Lady mission to get John out, it was a blessing to see them sent to Redemption. I swear you can’t write this sh*t.
For the first time this season, I’m excited to see ShaNelly walk into KamLeigh’s room after their purge loss. Nelson was probs crying the entire ride there, why else would he wear sunglasses inside? Kay is reluctant to give Nelly a hug because of the tea John spilled to her about his relationship with Natalie. Let’s get real here for a sec, John’s information wasn’t completely off. Any decently smart viewer would suspect that after Natalie expressed how much she loves Nelson, sh*t would go down between them. Considering #PaNatalie spent the entire game in Redemption, I’m wondering when and where they became besties. Bottom line is, if Nelson was my BF (God strike me dead) and I saw him getting way too cozy with Natalie, he’d no longer be my boyfriend. And Natalie’s chin wouldn’t be the only f*cked up thing on her face. Just kidding. Sort of. Next, John finds out about ShaNelly’s elimination. It’s like Christmas came early for him. Also, I’m not sure what it is about the guys wearing snowcaps in the house this season, but I’m not mad. Johnny is looking real good. Maybe it’s him, or maybe it’s the fact that I don’t sleep anymore. Either way, if this were a “who wore it best” contest, John’s got this in the bag and Nelson is still looking for his purse. 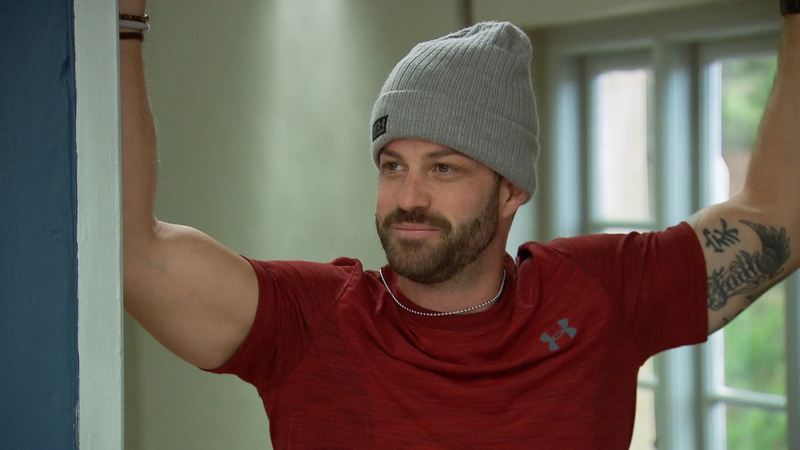 Then Shane claims his loss to Bananas was the worst loss in Challenge history. Alexa, play that episode from Vendettas where I got sent home stuck in a basket. Don’t steal my thunder, SHANE. 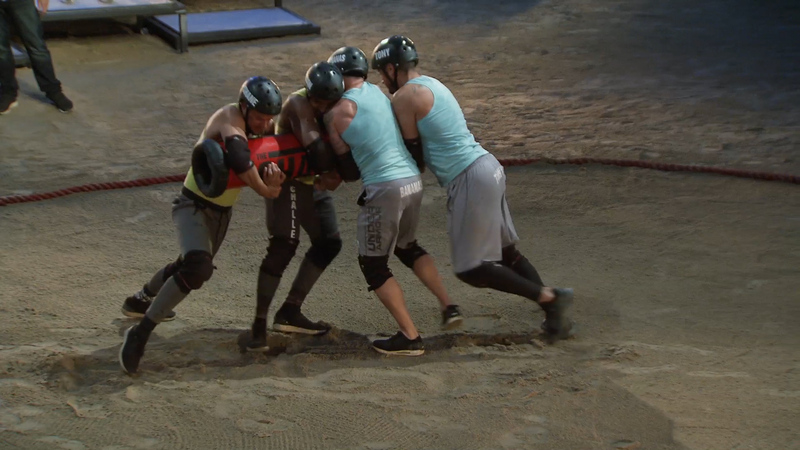 The male-male teams are all bumping chests and laughing about the fact that Shane and Nelson are in Redemption with them. 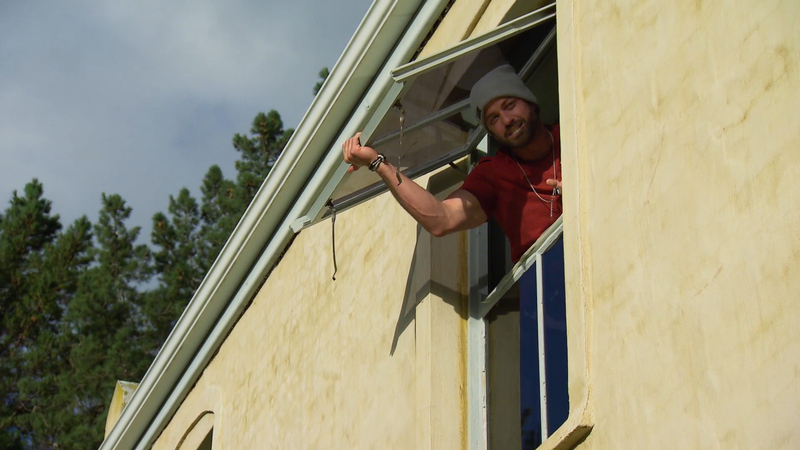 Outside, we see Shane chain-smoking cigarettes. That’s when Johnny pops his head out from the upstairs window. I love this moment. Not only because it reminds me of a breakup I once had, but also because Shane shows he’s as pathetically petty as I am. This moment is wrapped up with a beautiful quote from Shane stating, “I’m like a weed, I thrive on things that kill normal people.” OKAY SAME. After, Nelson and Kayleigh talk on the side of the house and decide to make up. Kayleigh says she’s fallen for him. I think I literally choked on my own laughter. Kayleigh “falls” even quicker than I do, which is actually quite impressive considering my fall time is unbeatable. I still can’t believe she’s romantically attracted to Nelson. To each their own, I guess. Shane and Nelson continue to take the heat from a newly revived John, and I LOVE IT. Tony asks Nelson, “you know how good I am now? What have you done?” This is giving me hope for my own Challenge glow-up. If Tony can have a comeback, anyone can. At the main house, Natalie reads the clue to everyone except for Cara and me because we were in interviews. Team LL and PaNatalie really want Nelson and Shane to come back. You can bet Cara and I will definitely not be jumping on that bandwagon. As friends, and for the sake of our position in this game, we really need KamLeigh and Banony to come back. Sidenote: Cara looks cute in pigtails. Now it’s time to pull the double-cross. TJ has room for four riders today, that means everyone gets a chance. BTW, can we drop this weird horseman apocalypse lingo? Kyle’s great at pulling the double-cross, but he’s total sh*t at eliminations. Kyle cracks me up. At Armageddon, TJ lets us know that REDEMPTION IS OFFICIALLY CLOSED! Tonight, everyone is playing and two teams are coming back. Kyle and Brad pull the first double-cross and decide to pick KamLeigh. Everyone wants to see ShaNelly versus Banony, so this was an obvious choice. I’m praying that Kam and Kayleigh can pull through and win. If they do, TWO male-male teams are going home. Production did not see this coming. Their chances at having new champions to add to their register is dwindling. I’m not mad. First up is KamLeigh versus Kyle and Brad. This elimination is one that involves brainpower (the ability to solve simple grade-school math) and strength. The teams strategize who should be climbing versus who should be doing the math. Brad shares that he’s taught several math classes, but decides to be the climber anyway. Wait. What? LOL. TJ blows the horn and we immediately see the difference in teams strategies. Kam decides to do her math on the ground, while Kyle and Brad use the board as draft paper. I see Banony helping with Kyle and Brad’s math equations and decide if he’s doing it, so am I. Difference is, I’m out here for KamLeigh. I post up on the men’s side and scream as loudly as possible to cause some distractions. I like to think I was a big part in KamLeigh’s win, but they’re just too good. What you don’t see in these scenes is that the boys rung the bell numerous times even though their math was wrong. Every time they’d ring, Kayleigh was taken down from her climb. Because they did this so many f*cking times, Kayleigh kept having to climb and was exhausted. Totally unfair. Finally, after lots of arguing, they let Kayleigh remain on the board while they checked Brad and Kyle’s math. And guess what? The girls took it home! Brad gives props to the ladies as he leaves the game. I’m low-key sort of sad. No more iconic lines from Brad the dad. We’ll miss you buddy. Next up, the battle everyone has been waiting for, Banony versus ShaNelly. For their task, they must use a cylinder shaped object to try and push each other out of a ring. I’m excited. Tony alone would be able to push both Shane and Nelson out. Which proves my point: you can be as fit as you want but sometimes it just comes down to pure size… and that’s why I eat fries. Banony wins and we’ve got the band back together. I’m skeptical of trusting PaNatalie but also fearful of seeing Tony and Bananas in the final. Things should get interesting. The closer we get to the end, the bigger the target on mine and Cara’s back grows. We welcome our old friends into the house and get the news that a challenge will be taking place tomorrow. At this point in the game, we’ve all basically figured out the schedule: purges always follow eliminations. It’s no secret that this season has been completely unfair for the girl-girl teams, and having a purge is terrible news for us. 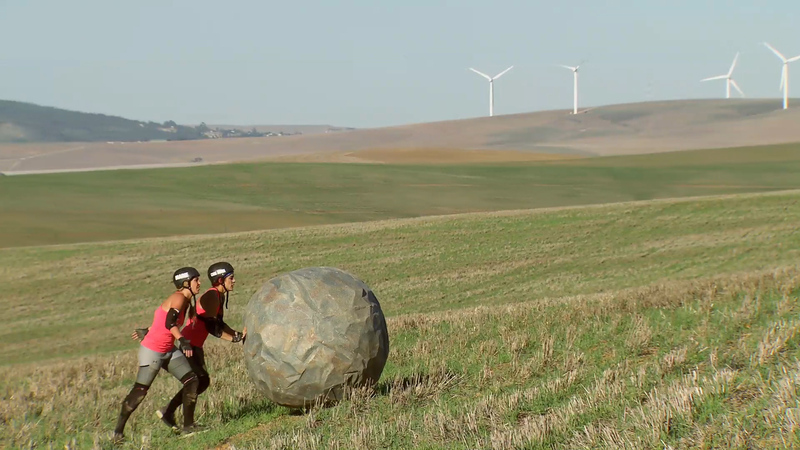 We get to the challenge and find out we’ll be pushing a massive rock. TJ gives us two options: either push through the ditch, which is more difficult but a closer distance, or around the ditch, which is easier but further. The rocks are heavy AF but each was weighted equally to match the competitors’ size. Finally, something equal in this game. I’m really over them going back and forth on their decision to use equalizers. It totally screws your game up when you assume they’ll be given, like say if Cara and I went against Shane and Nelson in a physical fight. Oh, wait. Sadly, Kam and Kayleigh lose and somehow Cara and I are able to overcome another purge. We might be second to last, but alive nonetheless. Yet again, they make it look like Cara was the only one pushing this boulder. Listen, Cara, I’m all about the girl power, but you do know I exist, right? Cool. Having Kam and Kayleigh leave is sad. Not only because they’re my girls, but because they have put up one hell of a fight this season. These bad b*tches took their loss with grace. Kam says she’s out to win the next one, and I believe her. Here’s hoping my girl pulls through. DRINKS ON YOU! Next week we’re down to five teams. There are no more lifesavers. If you lose, you go home. Here’s hoping I get the credit I deserve next week. If not, I’ll be sure to write about it here. HAPPY WEDNESDAY! Marie Roda is a Challenge veteran and hilarious person who can't stand bullsh*t.